The annual Dakar Rally is a quite simply a logistical nightmare. With more than 5000km of Peru covered over 11 days, the daily movement of possibly the world’s biggest circus doesn’t happen by accident. Each event is planned more than 12 months in advance and has a strict set of guidelines which forces each team to be incredibly self-sufficient and disciplined. 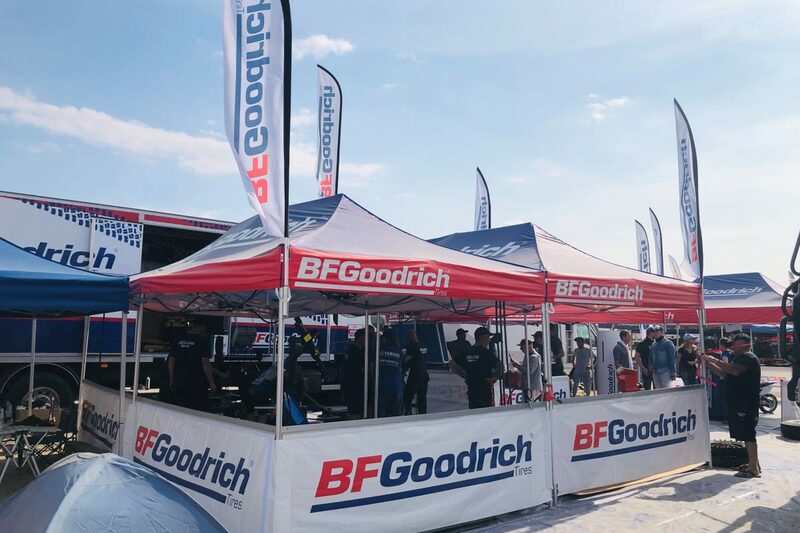 While things like catering and shower facilities are covered in competitors’ entry fees, one of the major technical assets comes in the shape of the BFGoodrich Service Centre. Whether using BFGoodrich tyres or not, the mobile centre provides a free fitting and advice service for every competitor in the rally. The centre, which consists of two trucks, all the fitting equipment, and several marquees, operates from 3pm to 11pm each day before being packed up and moved, sometimes several hundred kilometres overnight, and reassembled for the next day’s workload. 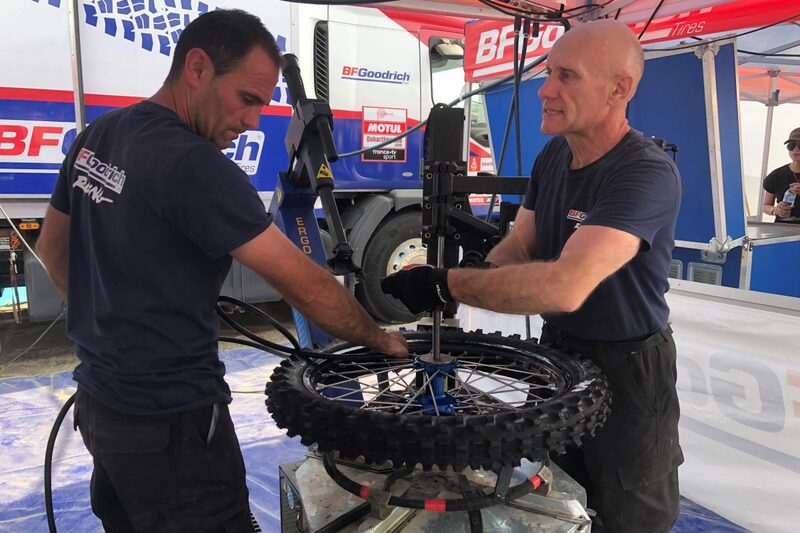 Overall, the centre’s 10 technicians will fit more than 2000 tyres at this year’s Dakar with all the evaluation and feedback being relayed to the company’s Research & Development Centre in Ladoux, near Clermont-Ferrand, France. The technicians are also on hand to discuss strategy for each day’s stage according to Frenchman Luc Fayolle, who heads up the operation. “Big teams know the type of ground they will find and here (Peru) it’s is predominantly sand,“ Fayolle told Speedcafe.com. “This morning they spoke with our technical advisor who is able to advice on whether they should use the soft or medium tyre and more importantly what pressures they should be running. Part of the teams’ need to be self-reliant is the responsibility of carrying all their own tyres. “Teams carry their own tyres because this is just too big a race,” explained Fayolle. “We are there to help them as much as we can and have the equipment to fit every tyre that is used on the Dakar. “It is only when teams don’t have enough tyres that they are in a bit of trouble. It is safe to say that when the company was founded by Benjamin Franklin (BF) Goodrich in 1870 in Akron, Ohio, the industrialist could not have imagined hundreds of vehicles roaring around the Peruvian desert on tyres branded with his name. Goodrich passed away just 18 years after this company’s establishment, but his son, Charles Cross, subsequently established the very first research facility in the United States. A lot of their testing was subsequently carried out at the Indianapolis Motor Speedway in the neighbouring state of Indiana, a venue originally established as a testing ground for the US motoring industry. Ironically, one of BFGoodrich’s first claims to motorsport fame came at IMS in 1916 when Englishman Dario Resta won the Indianapolis 500 in a Peugeot. The win meant that BF Goodrich had become the first tyre company to win the race back-to-back after Italian Ralph DePalma gave them their first win the previous year in a Mercedes. 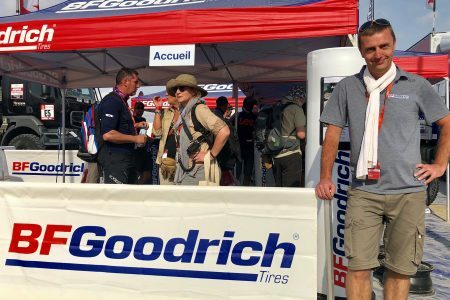 BFGoodrich’s reputation as a premium off-road tyre started in the early 1970s and its association with the famous Baja 1000, winning its first of more than 20 titles in the desert of Northwest Mexico in 1972. After a takeover by Michelin in 1990, the brand’s motorsport commitment received a whole new injection and international focus. In 1993, BFGoodrich won the inaugural FIA World Cup for Cross Country Rallies and Kiwi Rod Millen was on their tyres when he clinched the Pikes Peak International Hill Climb in a Toyota Celica in 1994. However, the springboard to the company’s current commitment to Dakar came in 1999 and 2000 when Frenchman Jean-Louis Schlesser won back-to-back events. Japanese driver Hiroshi Masouka then won back to back in 2003 and 2004 in a BFGoodrich-shod Mitsubishi, as part of a run of seven consecutive wins for Pajero and 10 consecutive victories for BFGoodrich. 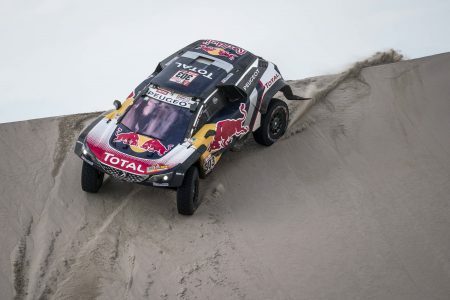 After a four-year dry, spell BFGoodrich returned to reclaim the Dakar crown when Stéphane Peterhansel, Sébastien Loeb and Cyril Despres made it a one-two-three finish for Peugeot and BFGoodrich. Arguably the most high-profile victory to date came just last year when Sainz led another podium whitewash for BFGoodrich in his Peugeot 3007 DKR ahead of Toyota Hilux drivers Nasser Al-Attiyah and Giniel de Villers. “Dakar is one of the toughest off-road events on earth because it is so long and has such tough conditions,” said Fayolle. “This year it is predominantly sand, but different types of sand and with very high temperatures and colder ones when we get to the higher altitude. “All that means we need to be able to handle a large variety of needs and usage. Fayolle just might get his wish with Al-Attiyah now a long way ahead of the rest and only two stages remaining. 2018 – Dakar produced an all-BFGoodrich® podium thanks to Carlos Sainz (Peugeot 3008 DKR) and Toyota Hilux drivers Nasser Al-Attiyah and Giniel de Villiers. Disclaimer: Speedcafe.com travelled to this year’s Dakar as part of a BFGoodrich contingent.